I love a good veggie burger and have posted about them frequently — whether it’s been cooking them or eating them — but until a couple of days ago, I hadn’t yet mastered the art of making buns. Well, everything changed with the help of a recipe I stumbled across in the New York Times. I had a good feeling about it since it was from one of my favorite LA restaurants, Comme Ca, and when I made these, I was not disappointed. 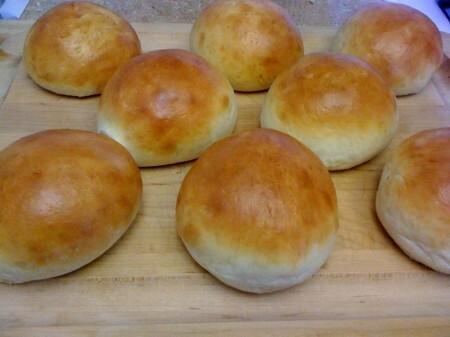 I could tell from when I started working with the dough that the buns would be light and airy, and as the dough rose, I got more and more excited. I also started preparing my veggie burgers. I modified the black bean burger recipe I’ve been using for a while to incorporate ingredients I had around, including squash and mushrooms, and I cooked the squash, mushrooms, onions and garlic before combining them with the black beans and making the patties to enhance the flavors. 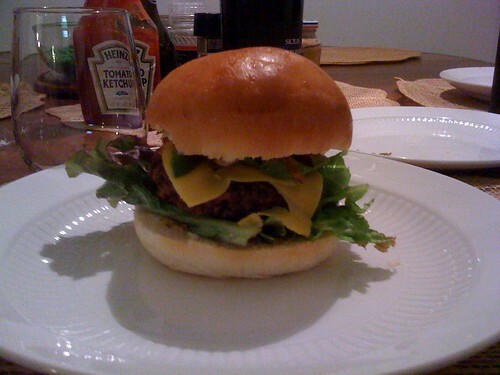 Everything turned out really well, and I served the burgers with avocado, sauteed onions, lettuce, ketchup and mustard. I think I’ll be making these again soon (like possibly this weekend). Much as it might sound ridiculous, the tastiest veggie burger I ever had was in Mazatlan (Mexico) at a place called Pura Vida. It might even be worth arranging a whole vacation around. given how tasty it was…. Cool! Maybe I will make it out there some day! mmm, looks so good! btw, it’s about time that we make some yummy plans soon!